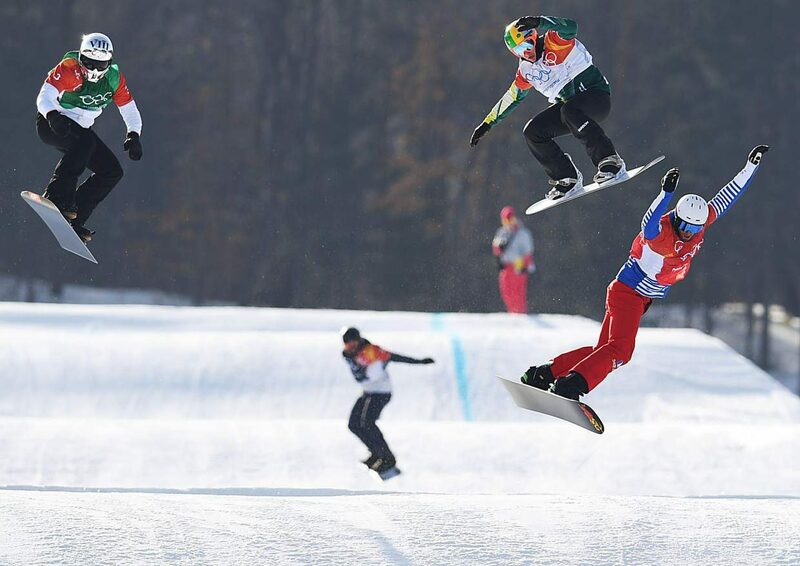 Pierre Vaultier, right, leads the way for the gold-medal final in mens snowboard cross on Thursday at the 2018 Winter Olympics in Pyeongchang, South Korea. He went on to win gold. Jarryd Hughes, second from right, took silver and Regino Hernandez, left, was third for bronze. Steamboat Springs skier Mick Dierdorff, center, was fifth. 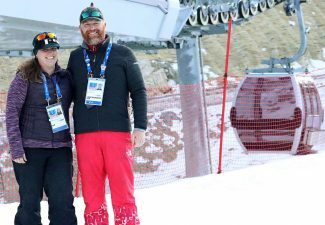 PYEONGCHANG, South Korea — Mick Dierdorff took his dream of an Olympic gold medal from the base of Howelsen Hill, where he began learning to ski and snowboard before he was 2 years old, to the snowboard cross World Cup where he endured years of tough results and seemingly stagnant progress. He never quit believing, however. 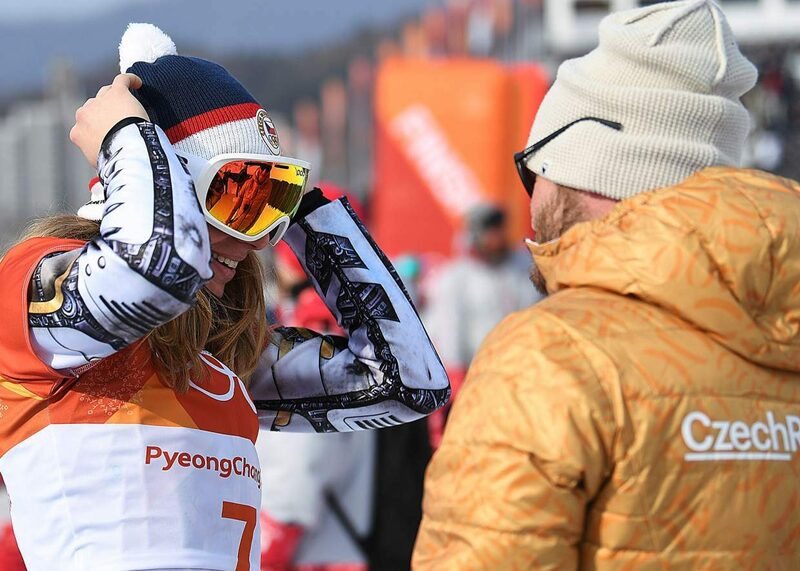 Even in the hard years, there were moments where it all seemed possible and this winter he rode a wave of momentum, the best season of his career, to a spot on the 2018 Olympic team. 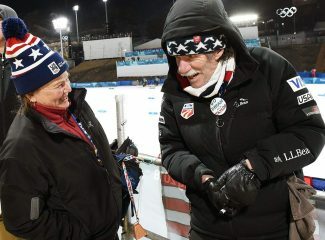 He carried that dream as far as he possibly could, advancing to the Olympic gold medal final before he finally fell short, finishing fifth, two spots away of a medal Thursday at the Phoenix Snow Park in Pyeongchang, South Korea. Steamboat wasn’t without representation on the snowboard cross medal stand. Pierre Vaultier of France won the gold medal. 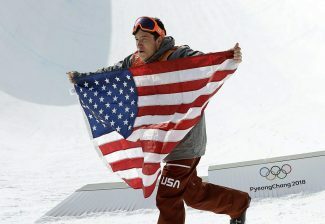 Jarryd Hughes, an Australian who spent several years training in Steamboat Springs, won silver in his second Olympics. Regino Hernandez of Spain won bronze. The U.S. advanced two riders to the six-man finals, but neither could final the podium. 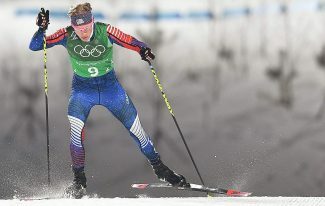 Nick Baumgartner finished fourth and Dierdorff was right behind him in fifth after both lost their feet midway through the treacherous Olympic course. “Being that close to a medal is going to fuel the fire,”Dierdorff said. The day didn’t start perfect for Dierdorff. He was the third out of the gate for the mornings qualifying round, racing alone and just against the clock, but struggled on the course and finished with the 26th best time in the 40-rider field. That pushed him into a second qualifier run where he cleaned things up. He was at his best once he got to bracketed racing. He won his first group of five to advance to the quarterfinals. It got dramatic from there, especially for his family, watching from the bottom of the course. A big screen following the race indicated Dierdorff was in the back of the pack, where a wreck eliminated all but two riders. They weren’t sure he was still on his feet until the scoreboard updated low on the course, and they screamed for joy as he leaped over the final jumps and across the finish. Things got even more tense in the semifinals. There, Dierdorff wasn’t able to avoid the traffic and actually went down early. It seemed like the end, at least until the remaining pack of five riders encountered more trouble. Only one finished unscathed, long before anyone else approached the finish line. The second crossed and more time passed. Finally, another rider approached, hopping over the huge series of jumps that led to the finish line. It was Dierdorff, third in the heat and advancing to the Olympic final, a position he’d always dreamed of. “I know how proud all my supporters are and it feels really good, coming down to the finish afterward and getting to see my family and friends who came over here, I don’t know if I’ve had a better feeling in my life,” he said.